Last weekend, my son's lovely girlfriend and I bought a couple of bottles of aloe vera water. She got coconut and I got mango. They were delicious! Refreshing, super-hydrating, and... FULL of sugar. Like 56 grams per bottle. WHATTTTTT? So, today, I was craving a refreshing glass of this deliciousness. Good thing we've got an aloe plant I haven't yet managed to kill (despite watering it way too much - I'll stop!). We've also got a gigantic patch of mint growing in the front garden. I also bought some limes (tomorrow IS Cinco de Mayo, after all) and cucumbers. A plan was a-brewing. I'd make my own aloe vera water, for Pete's sake... and I'd do it with no sugar! I mean, really... 56 grams. Kind of excessive, don't you think? Those things are very prickly, being in the cactus family and all. Rinsed it off (we don't use chemicals on our plants, so rinsing should be okay, right?) until it was dirt- and dust-free. Then butterflied it (for some reason, it seemed like the right thing to do). Next, I cut the prickly parts off, but not without first hurting myself on them. Then, I used my knife to cut all the goo out and scrape it into a bowl. So far, so good. I've been on a lime kick lately, usually just slicing them and putting them in some water. This seemed like I was leveling up. Also, anyone else wonder why limes don't seem to have any seeds (or many)? I mean, squeeze a lemon and you've got to spend the next minute or so fishing seeds out of your glass. Limes HAVE to have seeds, don't they? How else are they reproducing? OK, I'll save that little mystery to ponder long about 3:15 in the morning, when, apparently, I have a standing appointment to contemplate all kinds of weird questions. Turns out, I picked spearmint and lemon mint, which sounded delicious. There's also chocolate mint out there, but I've never figured out what to do with it... unless you count standing in the garden inhaling it until it practically goes up my nose? Something else to ponder, I guess. Hey, don't judge. Those things are delicious! We also just finished a jar of Claussen pickles, which are the ONLY pickles fit for human consumption, in my book. 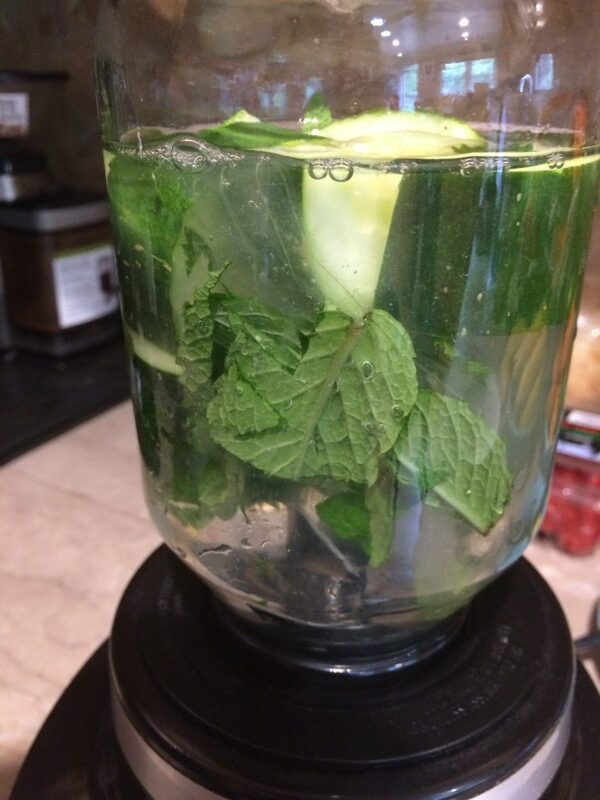 I chucked a few cucumber spears in there to see what happens. If you know what will happen, please tell me in the comments. What I'm hoping is that they'll regenerate like some sort of dill pickle clone. Will they? WILL THEYYYYYYY??? OK, best to hold the mason jar in place. If you're wondering why I'm using a mason jar, it's because the original blender jar got a brutal lesson in physics. It is no more. Not the fancy-dancy blenders... just the regular ones. Can't you FEEL the healthy goodness here? I mean, look at all that green stuff, all that pulp! It's got to be healthy for you!! By this point, my entrepreneurial little self is already contemplating how I can take this miracle aloe vera water goodness to market. Seriously. Labels, distribution, marketing, celebrity spokespeople... I've got the whole thing planned out. Even a brand name! Aloe Baby. Cute, right? I'm always tempted to drink the pulp when I juice stuff, and this looked so freaking healthy, the thought crossed my mind. Maybe it's my Scots heritage, or the fact my ex and I were so broke for so long, or it could be my mini-prepperness, but I hate to throw anything out when it seems like there's GOT to be a good use for it. Exhibit A: dryer lint. Seriously! Why isn't there something cool - other than very strange art - we can use dryer lint for? "That's probably why there are 56 grams of sugar in that aloe vera water!" The dude abides. That's all I've got to say about that. Anyhow, I'll keep hunting. Maybe there's a better recipe? Maybe there's a brand that's not all sugared-up? Or, maybe I should just stick to coffee and scotch, like a smart lass?